Phone and tablet versions are available. 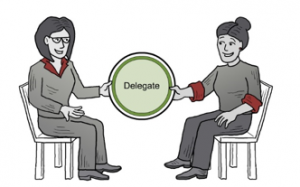 2-Way Delegation teaches business leaders, supervisors, managers, and team members the skills of giving and receiving work. The 46 pages of robust content include detailed information and exercises on the three phases of delegation: Analyze, Delegate, and Follow Up. Read the 46 app pages and complete the activities. You will see immediate improvement in the way you are delegating. Take the assessment, and identify your strengths and areas for development as a delegator or delegatee. Read the app and gain tips for improving low scores. Complete five in-app worksheets, and then download them to your mobile device for printing and repeated use. Read the sample language throughout the app to help you communicate with your direct reports or manager. Complete any of the 10 in-app exercises and apply what you learn. Use the community response in-app function. Contribute to any one of the 12 community-response requests, and then read what others have written. Use the Get Feedback in-app system to ask for and receive feedback on how you delegated work or how you completed delegated work. Read the stories throughout the app to increase your understanding of key learning points. Watch the two one-minute videos that illustrate critical learning points. Choose between three font sizes for comfortable reading. Check your progress by tapping on the Table of Contents. If you have read a section, there will be a check mark to the right of the section. If you have read an entire module, there will be a star to the right of the module name.